Few things feel as luxurious as relaxing outdoors on a comfortable chair. It takes a specific type of material to withstand wind, rain, snow and other elements. When it's time to choose new pieces for the porch or deck, make sure they're built to last. The main question is: What should outdoor furniture be made of? There are several durable materials to choose from, including wood, wrought iron, plastic and aluminum. Each has advantages and offers a variety of looks to suit your taste. Keep in mind that any type is made infinitely more comfortable by tying cushions on the bottoms and backs of each seat. Polyester fibers are water resistant so they're easy to clean. Air filters through to keep them smelling fresh and free of mildew. You should also consider how long you want it to last. Some manufacturers offer a warranty for a set number of time � 5, 10 sometimes 15 years. Even if you don't purchase the warranty, the number of years covered often indicates the amount of time the pieces were made to hold up. What should outdoor furniture be made of? Here are a few popular examples. This is a classic, versatile choice. Wrought iron furniture won't blow around as easily as others. It often has a formal look that goes well with contemporary and traditional homes. If you're short on indoor space, this type can be left outside if it's treated with the solution first. Iron is hard. Plus it gets hot in summer and cold in winter so cushions are essential. Read up on required maintenance in order to prevent rust and corrosion. If you buy an older piece that already has rust, paint it to improve the appearance. Partial to wood furniture? You're in luck. From cedar and pine, to redwood and eucalyptus, there's no shortage of varieties to choose from. Treat outdoor wood pieces with the right sealants and oils, and they can last for 25 or even 50 years. Store it indoors in winter to extend the lifespan further. Wicker is among the most lightweight. It's bulky, but relatively easy to move in and out of doors to prevent from blowing away. The material itself varies from natural to synthetic, including bamboo and rattan. Cleaning outdoor furniture is as simple as hosing it off and some sets can last for around 20 years. One of the most affordable options, plastic is lightweight and often stack-able so it's simple to shift around as needed. It does need to be stored indoors come winter and looks best when regularly cleaned with soap and water. Compared to metal and wood, this may not be the most attractive option, but it comes in a wide range of styles and colors. Some designs are more environmentally friendly as they're made from recycled materials. 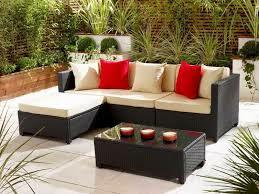 If you what to see and touch what should outdoor furniture be made of, head to the patio section. All outdoor sets are made to hold up to the wear and tear of weather and extensive use. Most varieties are made to last for years. Metal (aluminum or wrought iron) will likely last the longest, but synthetic wicker is popular for it's durability and rustic appearance. As with many big home decisions, allow your budget and personal taste to help guide this decision. Also, consider choosing the type most likely to hold up to the typical weather in your region. Remember that adding cushions is a simple way to adapt any set to your exterior.